Darcy being Darcy she has so many toys she could open her own toy shop. 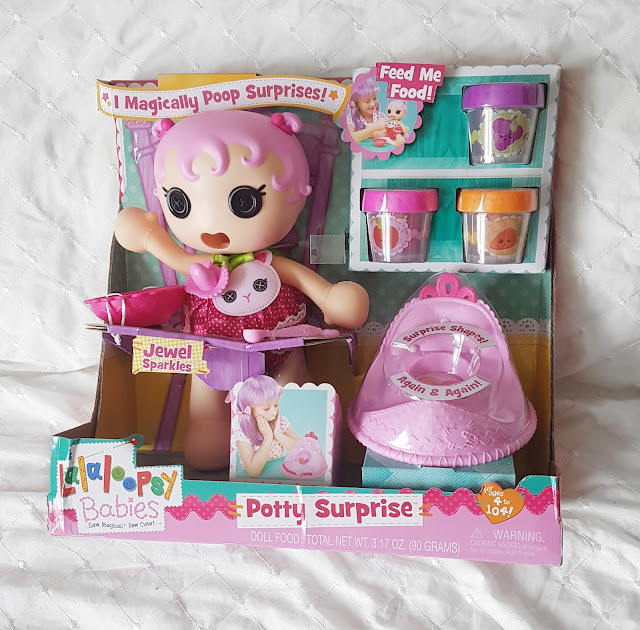 She has now added a new addition to her toy shop with a Lalaloopsy Babies Potty Surprise Doll, which we were sent to review. I'm going to be completely honest now and say this is not the type of doll I would generally buy Darcy. I mean c'mon a doll that poop surprises!, but I'll put my hands up and say this is actually a really fun doll and I'm really glad we had the opportunity to review the doll. As Darcy has fallen in love with it and plays with her all the time. Along with baby Jewel Sparkles, you get a potty, a bowl with a spoon and three jars of baby food. Jewel Sparkles head, arms and legs are movable and is wipe able and she has her trademark Lalaloopsy button eyes. First off you have to twist the dial on her back to one of the four positions, this will create the four different potty surprises. 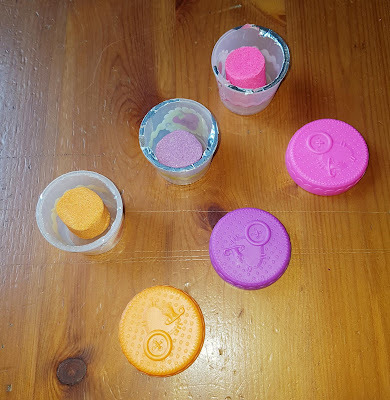 The baby food is actually kinetic sand, pop one scoop of carrot, apple or grape baby food (any more than one scoop at a time will clog up the doll) twist her belly button. Don't forget to take her nappy off! Simply place her on the potty and watch her go! Baby Jewel Sparkles magically poops a surprise shape, each poop is a different shape. 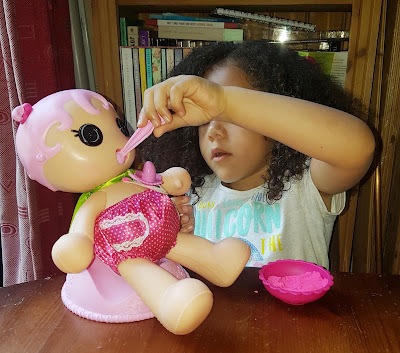 One of the good things about this doll is you never run out of baby food, you can even introduce new food to her diet with different colour sands. Even though this doll is for age 4+ Darcy was still able to play happily with her and the fact that I even had fun playing with her shows it's perfect for all ages. 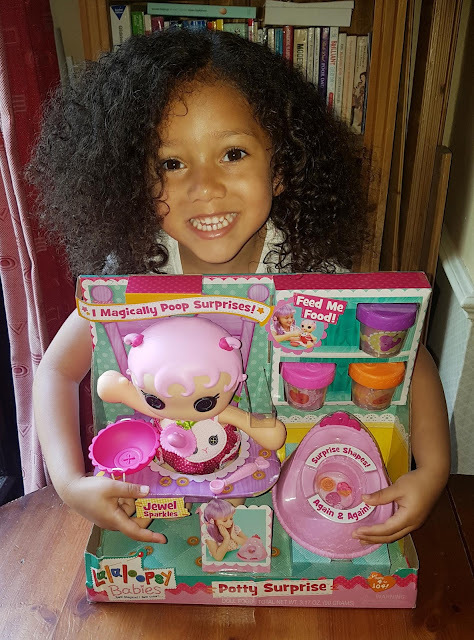 Lalaloopsy Babies Potty Surprise Doll retails at £20 and can be found at all good retail shops. Is your little one a fan of Lalaloopsy?